Join us for a press conference and petition delivery immediately following Governor Brown's State-Of-The-State Address. 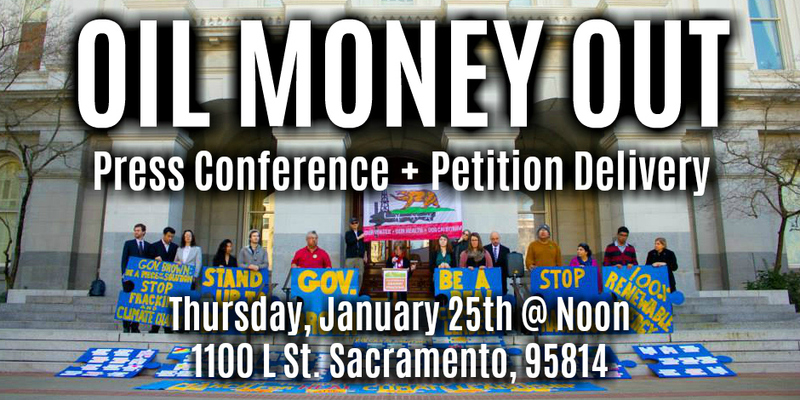 We’re coming together to call on the Governor and our elected officials to get oil money out of California politics! Activists, community members, health professionals and other experts will gather at the state capital to send a clear message to our California lawmakers, demanding they listen to state scientists who have determined that fracking and neighborhood drilling are dangerous for California. We will then deliver our Oil Money Out petition with more than 75,000 signatures (we're still counting) to Governor Brown. We are calling on the Governor to take bold action during his final year in office to solidify his legacy as a climate leader. Please join us this Thursday!